What's new in Revive Adserver v3.0.1? What’s new in Revive Adserver v3.0.1? Added support for SWF banners created using SWF version 11 or higher. Fixed upgrade bug – Revive Adserver no longer leaves all plugins disabled when upgrading using a different URL defined in the configuration file. Fixed issue with blank statistics pages under PHP 5.4+. Fixed various strict warning issues under PHP 5.4+. Fixed an incorrect email header name which caused some SMTP systems to fail to send emails. Fixed issue with some text not being translated in the standard reports. Fixed issue with being unable to save some of the options as an administrator in the Configuration > Global Settings > Banner Delivery Settings screen. Fixed a bug that unlinked all zone’s banners when editing the name or description of a zone, without changing the zone type or size. Fixed bug with user interface settings to allow a custom logo to display if set, without also requiring a custom application name. Fixed spelling issue in installer error message. The Reports Plugin has been updated to version 1.4.1 to fix spelling and punctuation issues in error messages. The IAB VAST Plugin has been updated to version 1.9.1 to migrate the video ad player information screen from an externally hosted location to the local Revive Adserver installation. This list covers some of the known problems with Revive Adserver. Please read this before reporting any new bugs. The upgrade process may time out with very large databases. 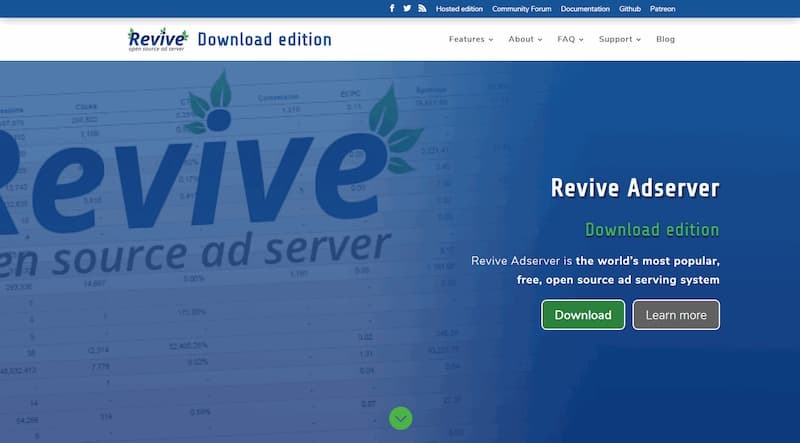 Revive Adserver requires PHP 5. If you are using PHP 4, you will need to update your web server to use PHP 5 before upgrading. If you want to run Revive Adserver with MySQL, please note that MySQL 4.1 or higher is required. If you are using an older version of MySQL, you will need to update your database software before upgrading. If you want to run Revive Adserver with PostgreSQL, please note that PostgreSQL 8.1 or higher is required. If you are using an older version of PostgreSQL, you will need to update your database software before upgrading. Some of the PEAR libraries used are not compatible with database prefix names with double “_” characters (e.g. “rv__”). You should NOT install Revive Adserver with a prefix of this format. Some users have reported issues of being logged out when viewing statistics. This can be worked around by ensuring that the timezone is correctly set in PHP. See Github for the latest bug reports.